You are invited to Parent Conference Day! Parent conference day provides you the opportunity to meet your teachers and learn more about your child’s academic progress and course expectations. The conference day schedule below features times for walk-in and scheduled visits. Feel free to drop in without an appointment during the Walk-in visitation periods. Teachers will visit with parents on a “First Come – First Served’ basis during the Walk-in visits. If you would like to schedule a specific time to see a teacher please call the main office at 587-5400. Each scheduled visit will be 10 minutes in length and will be strictly followed. 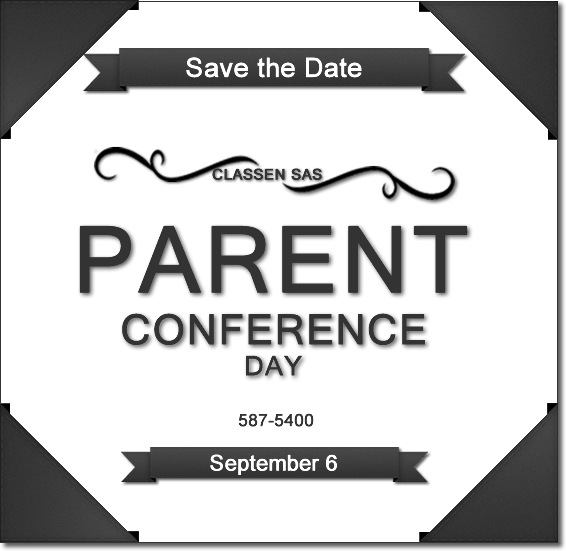 We hope to see you at Parent Conference Day on September 6th! August 29, 2013 in Announcement.